Last week County Executive John R. Leopold hosted a very successful Community Connections Day event and Constituent Open House. About 75 people attended at Severna Park Middle School. Participating departments and organizations include Planning & Zoning, Inspections & Permits, Social Services, Public Works, the Health Department, the Fire Department, the Police Department, Emergency Management, Recreation & Parks, Aging & Disabilities, Economic Development Corporation, Arundel Community Development Services, the Volunteer Center, Community Action Agency, Workforce Development Corporation and the Veterans’ Affairs Commission. The event, which is held every year, gives citizens a chance to meet with the County Executive and his Cabinet in a one-on-one setting to address whatever individual concerns they have. 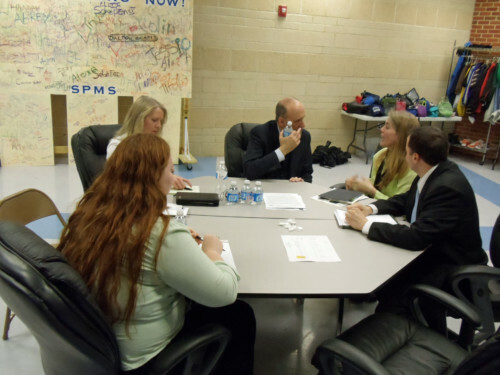 Photo: Pictured from left to right at the table are Emma Graybill, a student at Northeast High School participating in Student Model Government as the executive’s shadow, Director of Community and Constituent Services Brenda Reiber, County Executive Leopold, Annapolis resident Elizabeth King and Chief of Staff Erik Robey.